The following is my presentation to the Chicago Board of Education on Dec. 18 about my students opposition to the proposed charter school expansion on the Northwest Side. 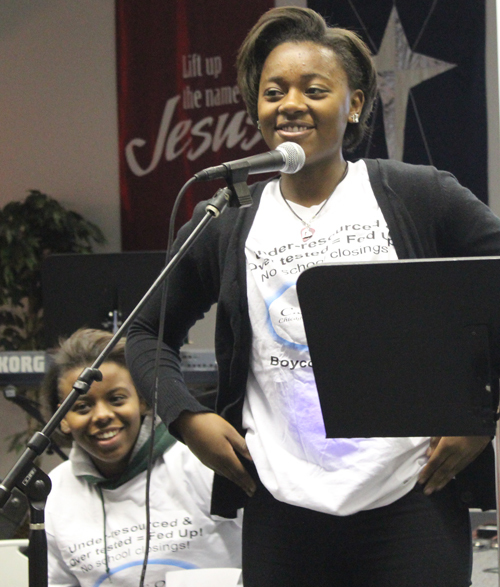 Steinmetz juniors Quinja Walton and Koya Scott spoke at the Dec. 11 NAC meeting.Our students know that the proposal to add two charter high schools to the northwest side is a bad idea. Students have been speaking out against the proposal� at a town hall meeting they helped lead, at press conferences, at a protest at Ald. Emma Mitts� office, at the People�s Board Meeting, and at the CPS neighborhood advisory council meeting last week. 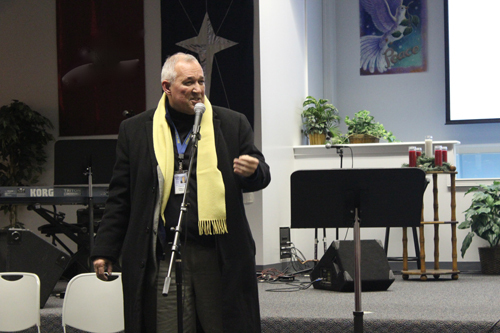 Schmidt quoted Prosser High School principal Ken Hunter, who spoke at the Neighborhood Advisory Council meeting on Dec. 11: "Putting a new charter high school across from Prosser is the stupidest idea I've ever heard." They know charter schools are unnecessary. There are five real, neighborhood high schools within 2 miles of the proposed charters that are not overcrowded. Steinmetz, Foreman, Schurz, Kelvyn Park, and North Grand are not overcrowded. What bothers students most is the fact that charters take students from existing schools. They know when enrollment drops, budgets are cut and programs and staff are cut. 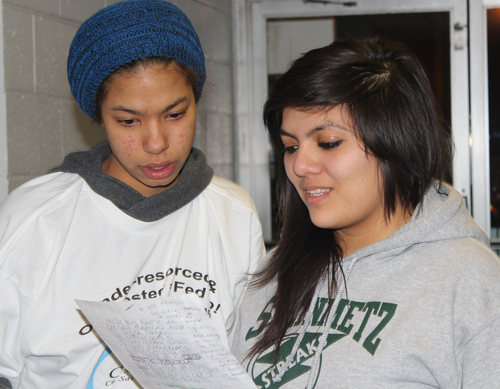 Albany Park Neighborhood Council youth organizer and Roosevelt High School graduate Sarah Johnson works with Steinmetz junior Brenda Barrera on her speech. Like many students who oppose charters, Brenda has experience with the draconian discipline methods of the charter schools. She wrote: "My brother attends Pritzker Noble and he gets in trouble for the smallest things, like asking his teacher to clarify a question. He gets detentions almost everyday. He has neck problems and therefore must rest his head, but he got a detention for doing so. Since my brother got so many detentions he has to take a $140 behavioral class in order to move on to the next grade. 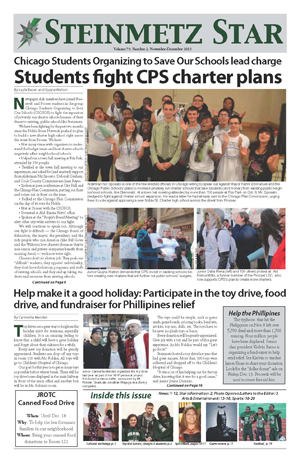 "Students feel threatened by the charter plan because it�s a plan to hurt Steinmetz. Steinmetz is their school � and like Prosser, Schurz, Kelvyn Park, North Grand and Foreman � Steinmetz is a great school. That�s the other reason I brought copies of the Steinmetz Star for the board members. Let�s not forget what exciting vibrant places our real, existing schools are. In the Star you will see several articles about successful alumni who treasured their days at Steinmetz. You�ll see reports on special programs, academics, the Gay Straight Alliance and many other clubs, and all the sports serving our students � thanks to long-term staff that creates and nurtures these programs. Volume 79, Issue 2, Nov.-Dec. 2013 Steinmetz Star, available online: http://steinmetzac.com/Prod/pdfs/Nov-Dec%202013%20Star.pdfSteinmetz has successfully served the students of the Belmont Cragin neighborhood for 79 years. Charter proposals are an attack on Steinmetz, and the students know this. The Children Know What's Going On. Very well articulated, Sharon and Steinmetz students. How can we have more schools this year, after closing 50 schools last year. Stability is the bedrock upon which learning is founded. Creating chaos, shifting schools, etc. is traumatic and unnecessary. Let's stop harming children by shuffling them around from school to school. Kudos to Sharon Schmidt. You used your 'personal business day' really well. Kudos to student reporters at the Steinmetz Star. You are producing a quality newspaper, writing about things that matter. I just added a new photo and caption to this article � Brenda's statement about Noble's discipline methods that she prepared for the Dec. 11 Neighborhood Advisory Council meeting. Students oppose charters because they know about their unfair discipline practices. The article is almost too painful to read.